What’s Your Gripper World Look Like? The Rise of the “Smart Gripper" is here. We’re Calling All Brainiacs to see what’s going on in their world at bringing intelligence to the end of a robot’s arm. What are you up to? Share it here with our global audience. 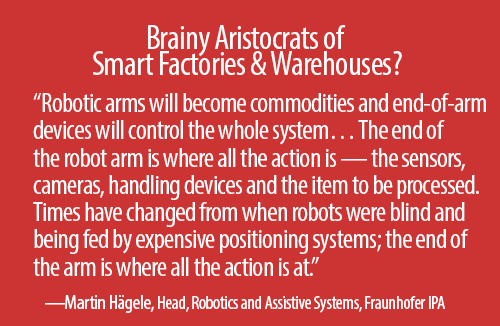 Advances in technology, the rise of the cobot, human-robot safety concerns, and questing after the “Smart Factory” and “Smart Warehouse” are having profound effects on gripper tech for both manufacturing and logistics. Advanced chips, 3D vision, haptics, new materials and designs, predictive data analytics, machine learning, miniaturization–and much more!–are headed towards robot grippers in a big way. How smart is your gripper? Tell us about it. If you are developing a brainiac gripper? How’s it going? What would go into your “dream gripper” if you had a chance to build one? Should smart grippers specialize at a single task or be multi-functional tools? Why? Share your gripper adventures with the world. Showcase your tech here in our very popular new column: The Gripper Chronicles. Just drop us a quick note by filling out the form below. Thanks. What next for the all-important, business end of every robot…the gripper? What’s your story? Are grippers getting a mind of their own?